This recipe is one that I’ve made a bunch of times and tweaked as I’ve gone along, so it’s an original to The Usual Saucepans. It takes about half an hour and serves 2. Heat your oven to 180°C. Start by slicing your onion into thin slices, halving your cherry tomatoes and breaking down your broccoli into florets. Also slice your halloumi, then drain and rinse your chickpeas. 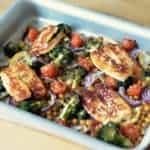 Put the onion, tomatoes, broccoli and chickpeas onto a large oven tray and then drizzle with the oil, season liberally and lightly squeeze some juice from your lemon half over it all. Slice up your lemon and chuck the pieces in the tray too. Get in there with your hands and mix it all together to ensure everything is mixed and coated. Slide into the centre of the oven for 25-30 minutes until the broccoli is cooked and starting to blacken on the edges. About 4-5 minutes before the tray is ready, put the butter in a frying pan and put on a medium heat. When it’s melted and bubbling add in your halloumi. Cook for about 30 seconds to a minute on each side (until golden). Remove the pan from the heat. Take the tray from the oven, sprinkle over the sesame seeds, add the halloumi on top and serve immediately.